It happened at the Tom Thumb grocery store at Belt Line and Preston roads. DALLAS — A second suspect remains at large after a robbery at the Tom Thumb grocery store near Belt Line and Preston roads in North Dallas Friday morning. Shortly before 5:30 a.m., officers were called to the scene on a report of a robbery at the grocery store. Officers saw two armed suspects leaving, according to Dallas police. One of the suspects was arrested. 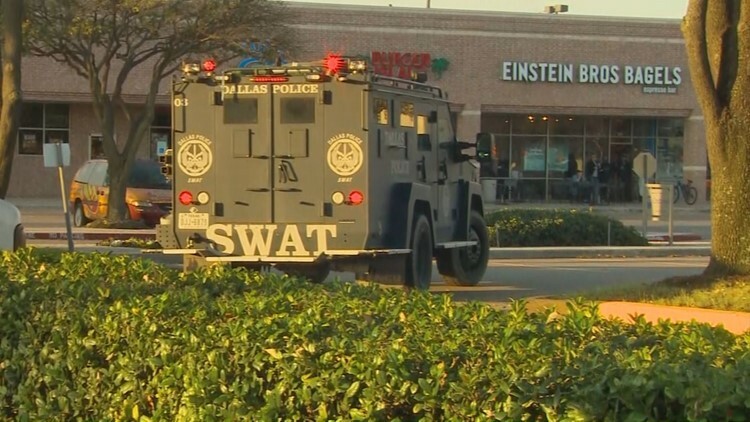 The second suspect ran back into the store, and that's when a SWAT team was called to sweep the area as police cars blocked off entrances. Officers closed off the entire shopping center for several hours. The store has reopened. Dallas police said the building was safely evacuated. Two employees sustained non-life threatening injuries. Police said they believe the suspects are responsible for a second robbery that happened Thursday before midnight at a Golden Corral at Forest Lane and Webb Chapel Road. Police are reviewing surveillance footage to identify the suspect.